Seven people have been taken to hospital after a suspected gas leak at a park in the south west of Edinburgh. The emergency services were called to the Walled Garden area of Saughton Park, which is in the final stages of a £7m restoration project. The Scottish Ambulance Service sent various units to the scene and took seven park staff to Edinburgh Royal Infirmary as a precaution. Gas engineers disconnected two central heating units in a park building. A fire and rescue service spokesperson said one fire engine was sent to the park after they were called at 12:23 and the crew left the scene after ensuring the area was safe. 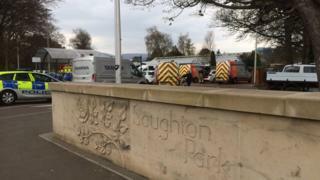 A City of Edinburgh Council spokesperson said: "The Walled Gardens in Saughton Park have been temporarily closed due to some staff feeling unwell. The area is now being thoroughly checked by various services. "While we have not had any reports from members of the public being affected the gardens will remain closed until we have established the cause." Saughton Park was the site of the Scottish National Exhibition in 1908 but had been neglected in recent years. A six-year restoration project costing more than £7m has almost finished and most of the park has been opened to the public.